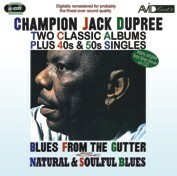 AVID Roots here presents two classic Champion Jack Dupree albums plus, including original LP liner notes on a finely re-mastered and low priced double CD. Champion Jacks Natural & Soulful Blues. Concluding side one and onto side two we have a selection of Jacks singles recorded in the 40s and 50s for such diverse labels as Continental, Red Robin, King and Groove & Vik. Unlike many bluesmen born around the early 1900s Champion Jack Dupree went on to have a very long and full life, travelling extensively around Europe and recording for many different labels as witnessed on this fine double CD. He finally settled in Germany where he died in 1992 having recorded over 40 albums!